Up until recently I didn't realize that Julie Andrews (Edwards) had written anything at all. Then I saw an autobiography pop up (which I desperately want to read, btw). In poking around online I discovered that Julie Andrews Edwards has not only written - but written quite a bit! Then, lo and behold, Jennifer from Snapshot posted her review of Mandy and, well, I was too curious. As I was browsing through Borders bookstore the other day I stumbled on a copy of Mandy and snatched it up right quick. Oh, how glad I am that I did so! It was fabulous on so many levels. Contrary to Cornelia and the Audacious Escapades of the Somerset Sisters, JAE uses large vocabulary words and trusts her audience (young OR old) to know what she means. In reading this book you can practically hear Julie Andrew's voice, stately and elegant, describing this charming world. This story is about a young orphan girl named Mandy who searches for a place of her own. In her searching, she finally finds a home. I liked this story from several reading personalities. 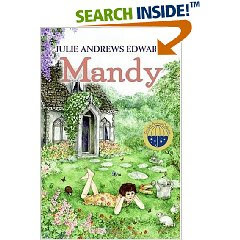 The "young girl" reader in me liked the imagination JAE used in building a secret cottage for Mandy to find and take dominion of. My "adoptive mother" side was moved in finding a lovable orphan discover her forever home. My "adult reader" side loved JAE's writing style. This book satisfied. Beyond my disclaimers though, I'm in love. It's classic, elegant and imaginative. There's hardly anything else to ask for! I read her biography not to long ago, so did Alison S. Both of us wrote up reviews, though not on a public blog. I'll have to see about reposting mine. She's read quite a few of JUE's books. My sister had this book, and I remember her enjoying it. I don't think I ever quite got it, but I recall that it had its charming moments. I don't think I ever saw this review. I remembered that you were going to read it after I mentioned it, but I'm glad to know that you loved it. It's truly a buried treasure. Have you read her other book, "The Last of the Great Whangdoodles"? (or something like that). I haven't, but Amanda did, and really enjoyed it too. I received the book on my birthday in 1972. My daughter and I just read it for her book report, and she loved it as much as I did when i was 9 years old reading it for the first time.